Mass Suicide As Ad Campaign? Here’s a tip for all you would-be restauranteurs out there: Don’t base an ad campaign for your eatery on a cult’s mass suicide. It’s unappetizing. Most people would think I’m being Captain Obvious here, but not so for the Indiana-based restaurant chain Hacienda. Which is probably being run by Captain Oblivious. 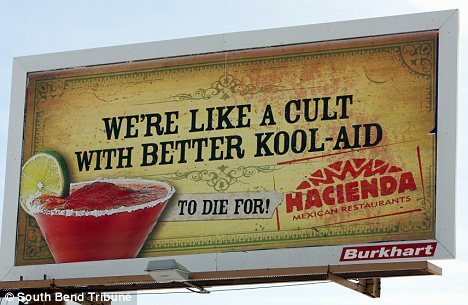 This photo from the South Bend Tribune shows the offending Hacienda restaurant billboard. In 1978, a cult led by a weirdo named Jim Jones took his flock to Guyana, and made 900 of his followers commit suicide by drinking poisoned Kool-Aid. Surprise! People who saw the billboards were offended. Hacienda is now taking down the billboards and rethinking their advertising campaign. Ya think? They’re not getting the reaction they expected? What exactly were they expecting? Do people want to go to Mexican restaurants to commit suicide? Join a cult? Thinking about icky, deadly cults somehow makes people hungry? What should they base their ads on next? Can they be more tasteless? There’s all kinds of bad things going on that they could use. Violence in North Africa. The earthquake in New Zealand. Rising oil prices. Britney Spears. It’s a Mexican restaurant, and there’s drug violence in Mexico. Maybe they should build an ad campaign around violent drug cartels? Next time they do an ad campaign, they should take my advice. Build the ad around something sunny and light. I’m ready to help. Operators are standing by. This entry was posted on February 23, 2011 at 1:15 pm and is filed under Uncategorized. You can follow any responses to this entry through the RSS 2.0 feed. You can leave a response, or trackback from your own site.